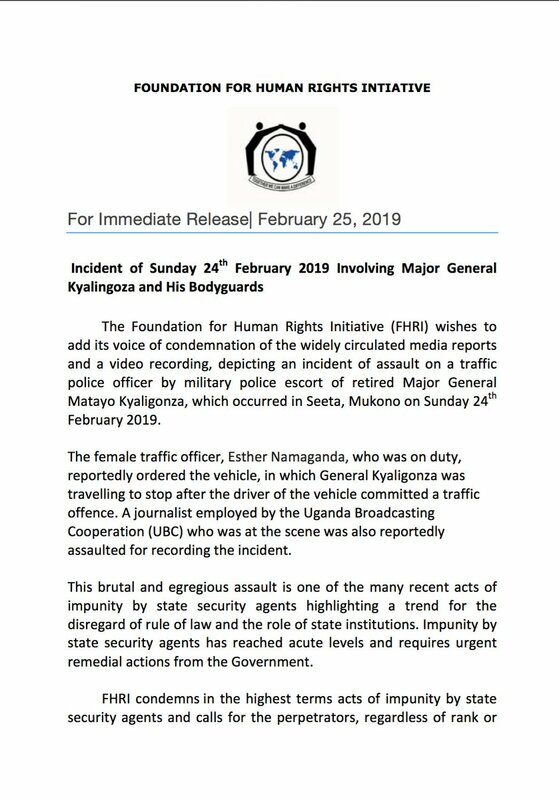 KAMPALA – Civil society organizations including the Center for Constitutional Governance (CCG) and Human Rights Network (HURINET) condemned the impunity unleashed a no a traffic policewoman by Uganda Ambassador to Burundi, Rt. Maj. Gen. Matayo Kyaligonza and his bodyguards. The retired general and his bodyguards on Sunday morning were seen in a video physically assaulting Sgt. Esther Namaganda in Seeta, Mukono where they also harassed a journalist. It is reported that a scuffle ensued after Namanda, (the assaulted officer) allegedly tried to stop the vehicle in which Kyaligonza was travelling for allegedly breaking traffic rules. The high profiled officer and NRM CEC top member had allegedly made a U-turn in the middle of the road contrary to traffic rules. Now civil society members have called for the resignation, arrest, and prosecution Rt. Maj. Gen. Kyaligonza saying that all citizens irrespective of their statuses are accountable to the law. 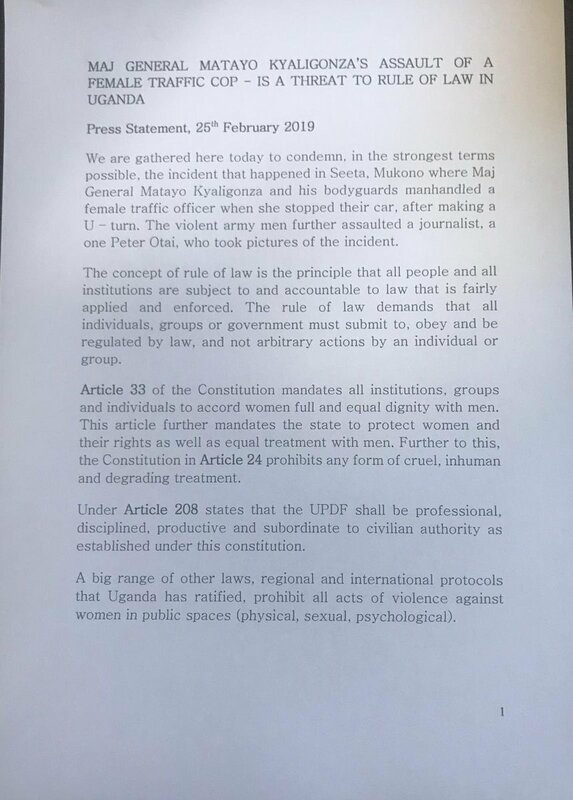 “The concept of the rule of law is the principle that all people and all institutions are subject to and accountable to the law that is fairly applied and enforced,” said Patrick Tumwiine of HURINET a press conference in Kampala on Monday. Tumwiine says Kyaligonza should submit to the same laws and that any transgression should be penalized. “The rule of law demands that all individuals groups or government must submit to, obey and be regulated by law, and not arbitrary actions by an individual or group. Retired general Kyaligonza should resign, be arrested and charged,” added Tumwiine. 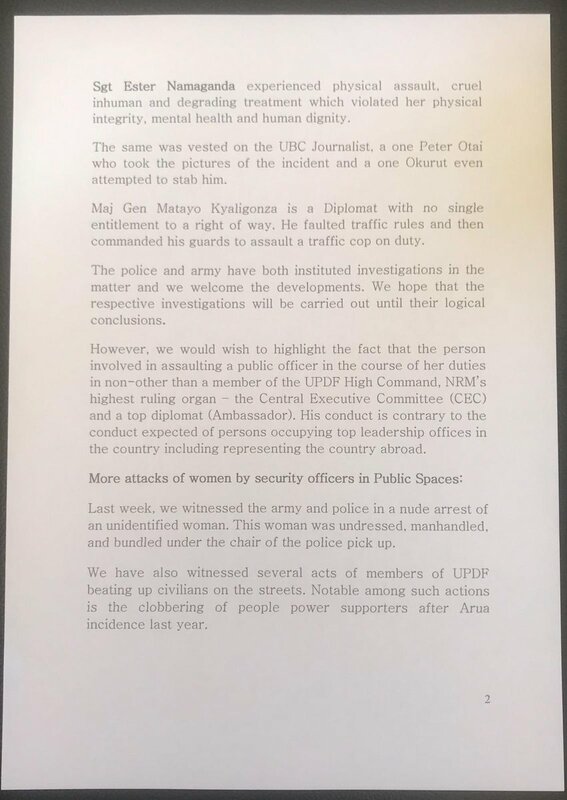 On her part, the CCG Director, Sarah Bireete at the same press conference, also attended by the daughter traffic police officer assaulted by Kyaligonza and his men on Sunday, said the actions of the retired general do not reflect the big titles he is holding. 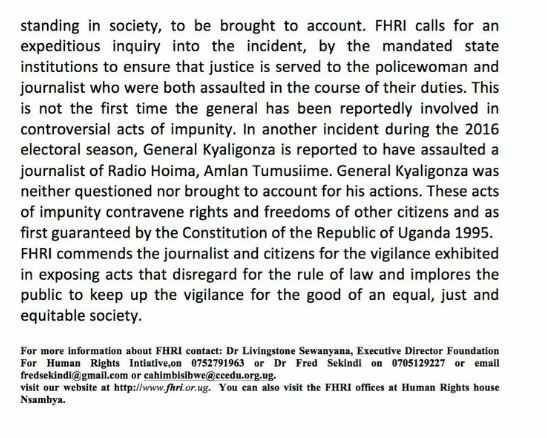 “The person involved in the assaulting of a public officer in the course of her duties is non-other than a member of the NRM’s highest ruling organ- the Central Executive Committee and Ambassador. His conduct is contrary to the conduct expected of persons occupying top leadership offices in the country,” said Ms. Bireete. Police leadership earlier confirmed plans to summon and charge the Ugandan Kyaligonza to pay for the impunity he unleashed on a traffic policewoman. Kasirye Ggwanga also an NRM historical recently shot at singer Catherine Kusasira’s car after her aides refused to lower the volume of the music that was playing in the vehicle. The incident, which occurred in Makindye Division next to the KCCA office, left the tyres of the singer’s car deflated. Witnesses told this website that Mr. Ggwanga’s children had come to buy food at a takeaway joint in Makindye. At that moment, Kusasira’s car, which was being driven by her aides, arrived with loud music blaring inside. In 2017 Brig. Ggwanga set ablaze a tractor that was being used to grade a piece of land in Lubowa, Wakiso District, which he said belonged to his daughter. On both occasions, he has walked away with it.